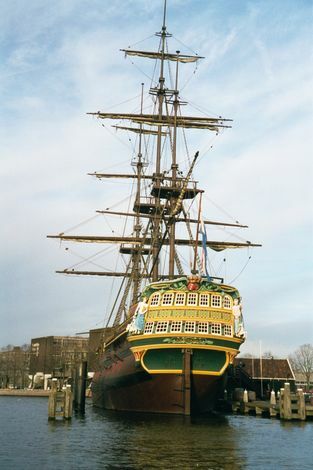 The Dutch East Indiaman "Amsterdam," a modern replica of a ship built in 1748. The original vessel never made it to the East Indies. Bad weather delayed the departure, an epidemic broke out, and the captain deliberately beached the ship at Hastings, just beyond the English Channel. He salvaged the crew and cargo, but the ship sank in the mud, where its hull can be seen today at low tide.